On 8 and 12 September, the CPT Iraqi Kurdistan team visited its partners in villages affected by the Exxon Mobil operations. The huge Exxon camp near Hajji Awa, from which the company conducted the oil explorations in Gullan village and Shawre valley sits almost completely empty. 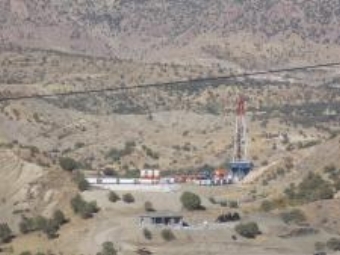 Kak Muhsin, mukhtar (leader) of Sartka, who's family lost seventy dunams of well fertile land to Exxon's first oil rig in Kurdistan told CPTers, “Since the beginning of August the drilling stopped and the staff left. I continue to receive my salary for doing nothing.” He refers to his new job as a standby evacuation bus driver in case Exxon drilling would release a poisonous gas. He did not have many options for work after hisgrape and fruit farming livelihood vanished over a year ago. Instead of vast orchards and vines overflowing with ripe grapes nestled in a beautiful valley, he looks down from his house on stretches of concrete platforms around a white-red drilling platform rising high to the skies, rows of plastic cabins and evacuation buses, besieged by seven watchtowers, all quiet at the moment. The unclear compensations sowed grains of conflict among the farmers in addition to the discontent they felt. In an earlier June visit to Hajji Ahmed, the landowners told the members of the team that they felt betrayed. They also raised suspicions about the different amounts of money the families received. And some have received nothing, even though their fields lay next to others that were compensated. ExxonMobil is gone for now. So is the trust among the community members as well as the freedom to enter the land, including the parts that keep on producing fruit and which need cultivation. Exxon will most likely return one day, unlike the land and the farmers' way of life.